When my alarm went off at 4:30am I was half hoping it was a joke, but I knew people were counting on me so I crawled out of bed as quietly as possible so I wouldn't wake up Matt. 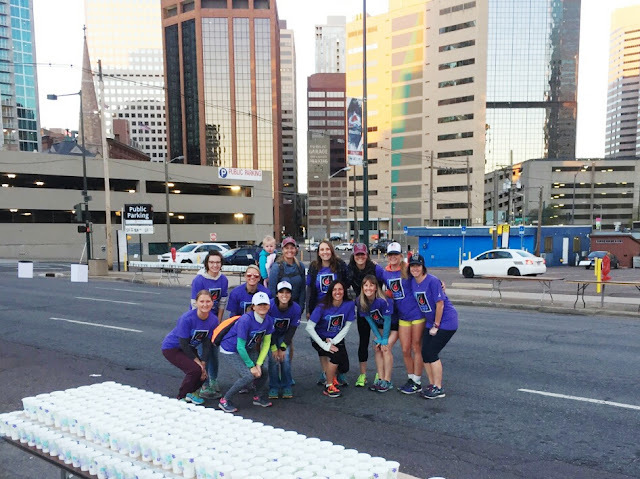 An hour later I was with my Oiselle teammates setting up tables, filling water cups, and getting ready for thousands of runners to come through our water stop just past 5 miles on the Rock 'n Roll Denver Half Marathon and 10k course. It's been far too long since the last time I volunteered at a race, and I was glad to be back out there. Here are three super simple reasons why I think all runners should volunteer for races. 1) Without volunteers, it's likely there'd be fewer races to run. This is a two-parter. First: economics. 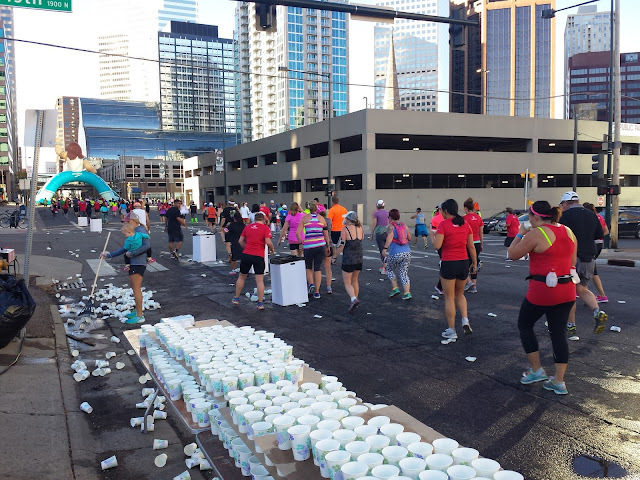 Race organizers - of all sizes, for-profit and non-profits - would have a difficult time making their balance sheets work if they had to pay all the people working water stops, start and finish lines, packet pick-ups, etc. Second: Experience. People are needed in all these positions so that the event is safe and people (runners, spectators, and community members) all have a great experience. If a race isn't safe or fun, it won't last long. Volunteers are as essential as participants for a successful race. 2) As members of the running community, and people who benefit from the support of race volunteers, it's important to give back. For any community to be productive, positive, and long-lasting, we need to support one another, give as much as (or more than) we take, and encourage the best out of ourselves and our neighbors. That means volunteering our time, talent, and effort. Supporting others in our community. Yes, you'll likely have to wake up really early, you might not get your own run in that day, and you might get wet and dirty, but it's worth it! All the 'thank you's' and smiles you receive, and knowing that you're helping runners - of all levels - tackle their goals, makes all that well worth it. There's something so wonderful about knowing that you're helping make someone else's day a little bit easier and a little bit better. I volunteered with several of my awesome Oiselle Colorado teammates (two of whom drove 1.5 hours to join us), but even if you volunteer on your own or with just a few friends or family members, it will be as fun as you want it to be! Please don't take your volunteers for granted. They are giving up their time to help you and your participants. Give them the information, tools, and support they need. Thank them and do all you can to make sure they feeling appreciated. Remember, without them, putting on your race would be a lot harder! Do you volunteer at races? * If not, what's holding you back?